Nourkrin® Conditioner has been scientifically formulated to stimulate and protect the scalp and increase the hair volume. It provides gentle nourishment and volume and makes the hair soft and easy to comb, helping to provide the ideal environment for the recovery of healthy hair. After washing thoroughly with Nourkrin® Shampoo & Scalp Cleanser, apply Nourkrin® Conditioner to the full length of the hair and massage into the roots. Suitable for all hair types including fragile and delicate hair. Suitable for daily use. 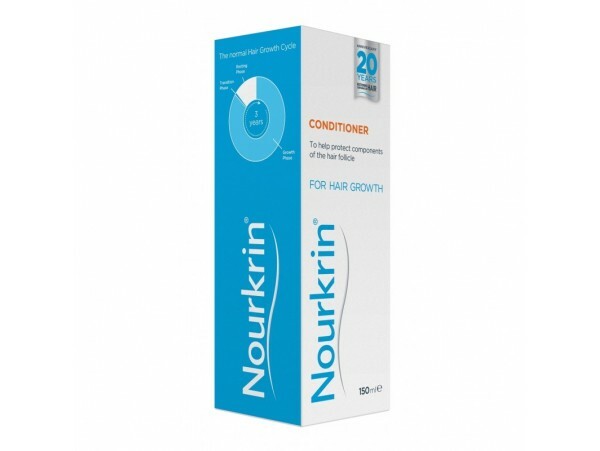 For best results use the complete Nourkrin® range of Tablets, Shampoo and Conditioner. Aqua, Behenamidopropyl demthylamine, Ceteraryl alcohol, Lactic acid, Shea butter ethyl esters, Menthol, Butylene glycol, PPG-26-Buteth-26, PEG-40 Hydrogenated castor oil, Apigenin, Oleanolic acid, Biotinyl tripeptide-1, Propylene glycol, P-Anisic acid, Levulinic acid, Diazolidinyl urea, lodopropynyl butylcarbamate.